I've been experimenting with the pendulum mechanism that I'm using in the forthcoming dragonfly. I'm wanting to make the pendulum move faster to make the wings flutter faster. In the current model (left) the coin is hanging vertically and the centre of gravity it roughly 30mm from the hinge. 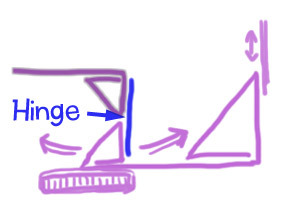 To make the pendulum swing faster I need to move the coin closer to the hinge. 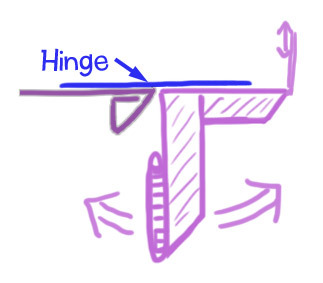 Also, there is a problem with design in that the hinge, because it is horizonal, tends to peel apart because of the weight of the coin. To move the coin closer to the hinge I have rotated it by 90° so that it lies flat. I've also made the hinge vertical, that way it wont peel apart. Two birds, one stone. The pendulum length is now roughly 7mm, about a short as I can get it I reckon! and here is the top view showing where the wing linkages attach. One nice side effect of this design it the base can be really thin, as little as 20mm. "To make the pendulum swing faster I need to move the coin closer to the hinge." How can you know these things??!!!!!! Argh! See, this is where I can only nod and say yeah yeah yeah, give me the model to construct after you are done being brilliant! I was hoping that, by your generously sharing the process that leads to your perfecting these Ives models, I would begin to glean some slight ability to concoct my own one day. Yeah. no. Not going to happen. I'm doomed to simply read and watch you here, jaw agape. 1. Continue the hinge up and fold over to the left. 2. Cut a new strip of the same width as the upper part supporting the hinge but folding it in a complimentary triangle to support 1/2 th weight of the coin. 3. Extend the hinge downward and along the triangle next to the piece just above the coin and fold it in to the triangle. 4. Lastly make another folded triangle and glue it in place against the hinge and the horizontal piece. This should provide the extra support for the hinge. Let all the glue joints dry completely and then slip the coin into place. Crimp and glue the two corners to the left of the coin and glue to secure. my head hurts …. again. My apologies for the post above. it is Carrying coals to Newcastle" as that problem was already solved. 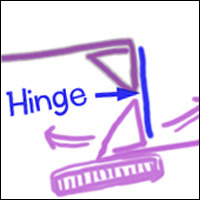 With the pivot or hinge point as shown in the second drawing, there is no tendency to peel apart. The frequency of a pendulmun is determined by the distance from the pivot point to the c.g. i.e. 'center of gravity' of the total mass. This is easily done by using two coins, one on either side of the vertical center line. With that out of the way we can let Rob get back to the business of finishing up the dragonfly! Great advice, Rob, will do. Great advice, Rob, will do. thx!